For a number of years D. catalinae was sold under the name of D. pusillus as a result of confusion in its original identification1. Growers should note that there are a number of journal articles and papers from the 1990s referring to D. pusillus. The beetle used for these studies was actually D. catalinae. 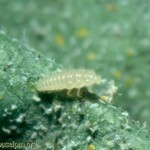 Both adult and larval Delphastus feed on all stages of whitefly, particularly on the eggs and nymphs, but it avoids parasitized nymphs2. This behaviour makes it compatible with the use of parasitic wasps. 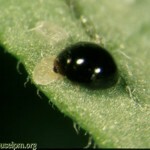 The adult beetle is a small black lady beetle, only about 1.5mm long (Figure 1). The females have a reddish brown head which distinguishes them from the males. They are active fliers and readily move throughout the greenhouse. 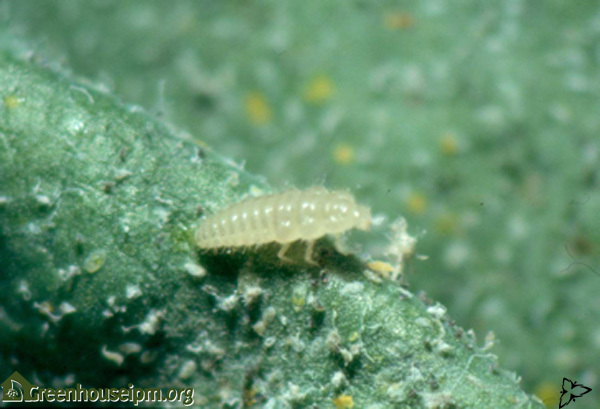 The larvae (Figure 2) are a cream colour and elongated, with the oldest larval stage being approximately 4-5 mm long. 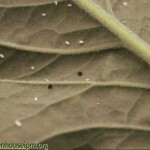 They move slowly on the underside of leaves wherever whiteflies are present. It is a voracious feeder, and in research with Bemisia tabaci, the adult is capable of eating more than 160 whitefly eggs/day, and the larvae almost 1000 eggs before they pupate. 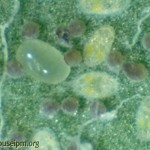 Females lay approximately 180 eggs during their lifetime (Figure 3). This data is based on laboratory research, but there is evidence that both feeding and egg-laying are significantly greater in a greenhouse3. Delphastus is packaged in small containers containing 100-1000 beetles. They are protected by packing material such as shredded paper or buckwheat hulls. Refer to the Revised Grower Guide to determine the quality of the Delphastus at receipt at the greenhouse. Delphastus becomes very active when the product warms up, so they should be released as soon as possible after they are received. Producers recommend that they can be stored for 1-2 days at 10-16oC. Mix the product gently before releasing in the early morning or evening. It is recommended to release in the beetles in clusters directly on infested leaves. 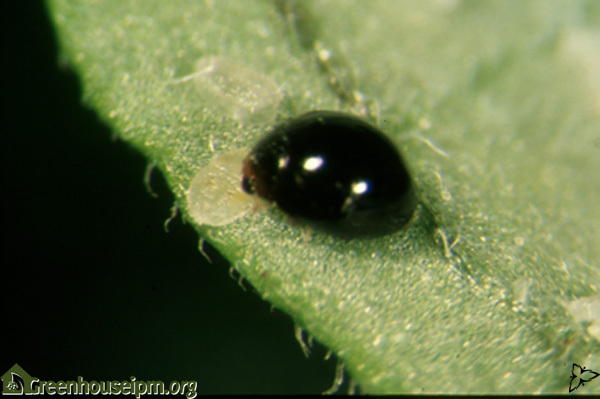 Because of their compatibility with parasitic wasps, it is recommended that these beetles be used in conjunction with Encarsia or Eretmocerus for reducing whitefly populations. Delphastus does not diapause (hibernate), so they will stay in the greenhouse over winter. However, observations from Ontario greenhouses suggest they are not very active and populations decline, although they can recover naturally in the spring without additional introductions. 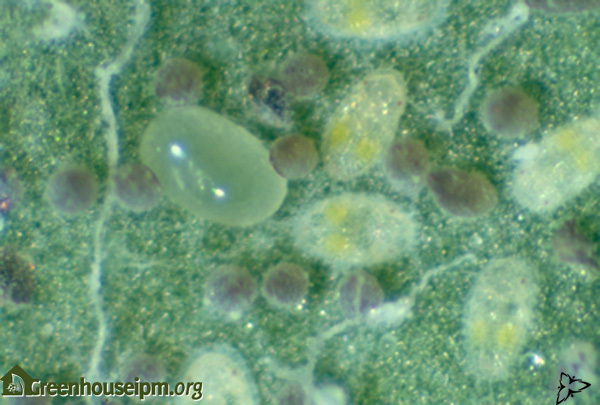 However, most growers using Delphastus re-introduce in the spring to speed up the development of the re-establishment. They should only be used when average greenhouse temperatures are above 20oC; optimum temperatures are 22-30oC. Introduction rates are recommended at 0.5-1 beetles/m2 for low populations of whiteflies; and up to 2-4 beetles/m2 for heavy populations. It is suggested that 500 Delphastus be applied up to 100/m2 for heavily infested hotspots4,5. Introductions should be made weekly for 3-4 weeks. 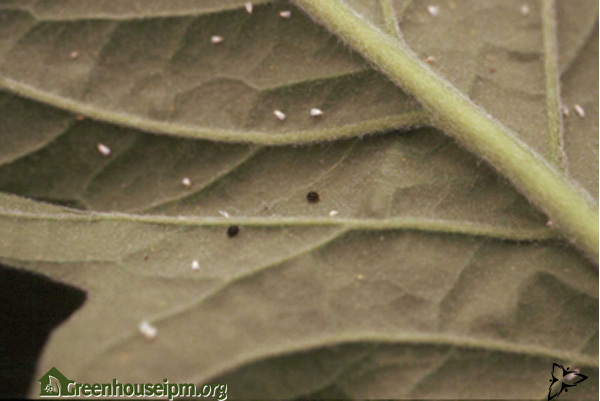 Beetles (both larvae and adults) are easily visible and can be monitored by checking the underside of leaves in whitefly infested areas (Figure 4). 2Hoelmer KA, Osborne LS and Yokomi RK, Interactions of the whitefly predator Delphastus pusillus (Coleoptera: Coccinellidae) with parasitized sweetpotato whitefly (Homoptera: Aleyrodidae). Environ Entomol 23:136–139 (1994).